In my younger days, when my husband was still alive and our house fairly sparkled with Christmas lights, I brought a homemade chocolate silk pie over to a lonely neighbor in her seventies. She took one look at that thick, uneven crust and said, "I don't eat pie." Well, gosh, what do you say to that? I meant to do something nice for a woman who was alone for Christmas, and what did I get for my efforts? A big fat bah humbug! Now I'm in her shoes. I'm the old widow on the block and the younger women think they're doing me favors. Two years ago, Natasha came by and hung a fuchsia wreath on my door. What do you say to something like that? I said, "Where in the dickens do they sell fuchsia wreaths?" She said, and very proudly I might add, "I made it myself." Let's be honest. If she had brought me a pie, I could have accepted it and thrown it out. But what could I do with that fuchsia wreath? I mean, people would think that's my taste! So I took it down and told her the dog ate it. Then last year, she hung a neon red mess on my front door. I don't know what's wrong with her! What happened to green wreaths made of pine, and adorned with berries and pine cones or even just a nice red bow? So this year, I'm a step ahead of her. I bought a nice green wreath, just like the ones I used to make myself, and I've already hung it on my door. And I bought a lovely purple feather gizmo and hung it on Natasha's front door. Wonder what she'll say? Hehehe. The joy of Christmas giving! I believe I'll pour myself a nice eggnog and spike it with a little bourbon. Y'all have yourselves a good Christmas! I would love to see the look on Natasha's face. Now, you know she was trying to be nice, but I'll bet she likes the purple!! Merry Christmas Francie--I bet you get a fruitcake this year instead of a wreath:). She might like the purple if she had made it. Now she'll have to add gnarled twigs and edge each feather in silver, gold, or metallic peacock blue. Ah, the spirit(s) of Christmas live on! Very clever, Francie. Enjoy your eggnog! Hysterical! I love it. Revenge is sweet. Me too, Dru. I've been spying on her house all morning. Oh no! You're all right! Janet, she already added some kind of gold glitter to it. Victoria, she loves it! And Lucy, she brought me a fruitcake that's so heavy I could use it as a doorstop. Actually, I might use it as a doorstop. Hmm . . .
Erika, I nearly choked on my eggnog when I realized I might have to see that thing on her door every year. 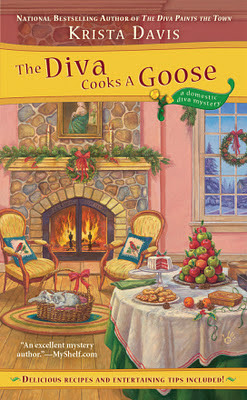 Kaye, revenge is supposed to be sweet, but right now I'm feeling a little Scroogish because it backfired! Francie, you are a hoot. I love the purple one you put on Natasha's door. What a fun prank!